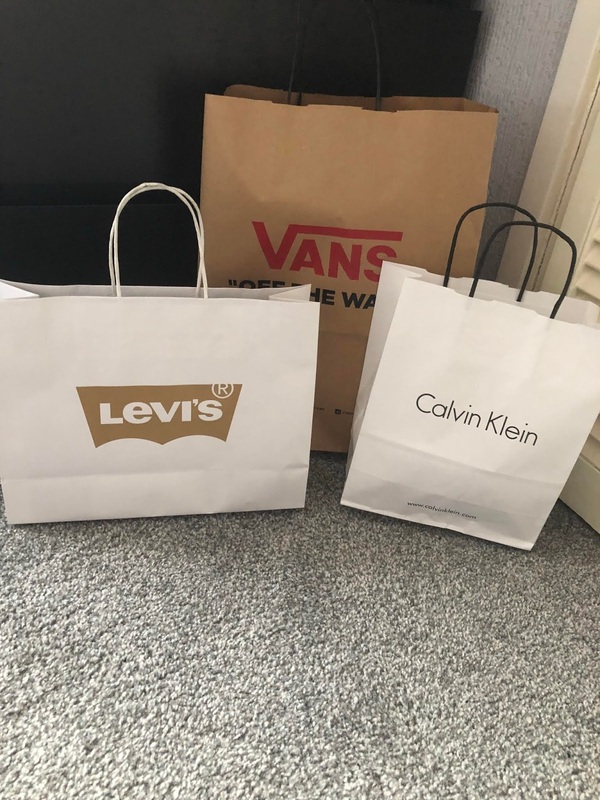 I promised myself on Saturday night that if we stopped by York Designer outlet I was only going to spend £50 but this didn't really go to plan. In total I spent £61 which to be honest still isn't bad especially for me. When I go to places like this I just seem to lose control and go totally over board with things that I don't need. With a budget in mind though I managed to keep things pretty reasonable, I didn't buy really unnecessary items and only picked up things I fell in love with or required. First up I got a grey Levis t-shirt for £14 purely because I got one in navy a few month ago and they are such good quality. I have decided that I may need to get them in a few other colours too. I then went to Calvin Klein, this is somewhere I haven't purchased from in ages due to my size but I thought it was time to treat myself, at £8 a pair they were a steal. Again I think I will be heading back for more pairs and eventually some clothing. Finally I ended up heading back to the Vans store. I really didn't need these as I have far too many pairs of shoes but these are maroon with a nice gum bottom. Plus they were £23 so a bargain to add in to the rotation. I have to admit I have a bit of a love hate relationship with Vans but I can see me falling in love with these especially when we finally get into autumn. These items would have been way over £100 if I went to buy them at retail price so I definitely did well. I have told Liam I am wanting to save up a bit especially as I am loosing weight so we can go have a real shopping trip there and I can pick up even more pieces. I love the fact you can pick up a variety of things for so little, plus I really want to go when the Nike store reopens. Keep an eye out on the t-shirt and shoes being featured in some up and coming posts.